Granite Plus partners with the best suppliers to bring you the widest selection of choices. Whether you're shopping for granite countertops, marble tile, quartz bathroom cabinet tops, or other materials for your home or business, Granite Plus carries hundreds of styles and has access to thousands more from our suppliers. If you don't see what you're looking for at our showroom, we can easily order from our network of partners to find you the right material for your kitchen counters, bathroom cabinets, tables, fireplace surrounds, tiles, and any other stonework. The stone fabricators at Granite Plus offer personal service, artisan craftsmanship and affordable prices for all countertops, outdoor kitchens, fireplace surrounds and other custom stonework. 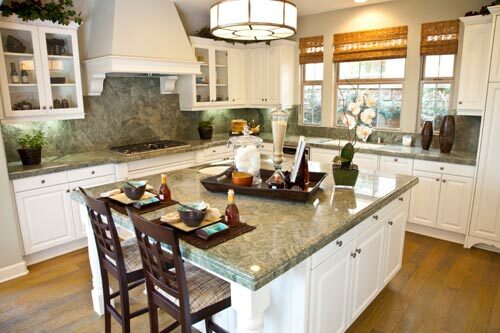 Quality custom countertops handcrafted from quality slabs of granite, marble, quartz and more. Visit our New Berlin warehouse to choose your stone. Granite Countertops Starting at $34.99/SF, While Supplies Last! 45 SF minimum Purchase. Restrictions May Apply Subject to change without notice. May not be combined with other offers.